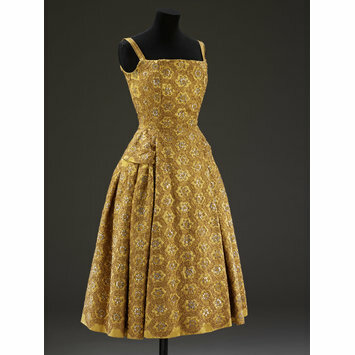 This dress comes from Christian Dior's (1905-57) H-Line collection of autumn/winter 1954-55. The H-Line was one of Dior’s most controversial silhouettes, and the press debated whether it should stand for ‘Heavenly’ or ‘Horrid’. The design of the H-Line deliberately flattened the bosom to create a moulded, elongated shape that many found unfeminine. Dior maintained that it was inspired by Tudor dress, this influence can be seen here in the rich geometric embroidery of this dress. The dress was worn with a gold satin coat, originally designed with a dark fur lining. Evening dress of heavy gold satin entirely covered with embroidery in gold metal thread and couched gold metal thread of decorative interlocking hexagons around embroidered flowers of silver metal thread. The dress is below knee-length with straight cut top which flattens the bosom, shoulder straps and a panelled front. The sides and back of the bodice are stitched down to a partial peplum around the hips, with the skirt flowing beneath in unpressed pleats. The bodice and skirt are lined in white silk organza but the yoke of the skirt in unlined. The dress fastens with a centre back zip and the skirt with press studs and hooks and eyes. 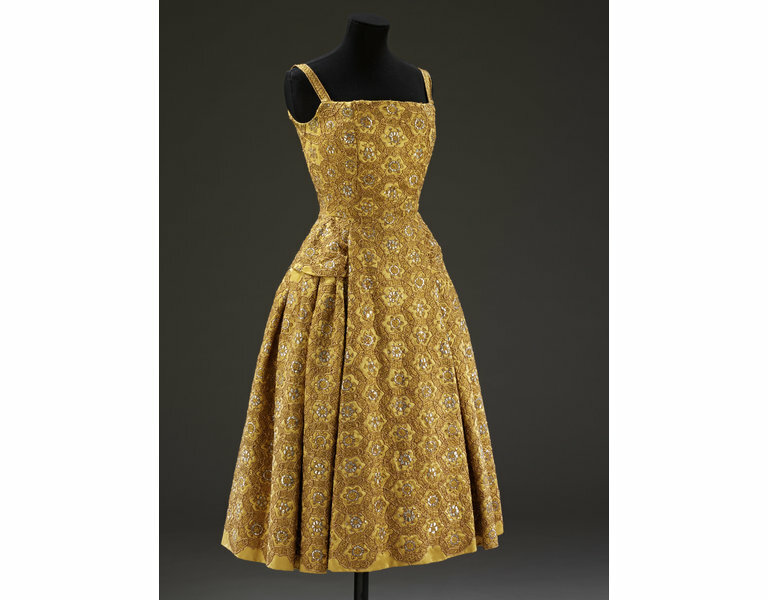 An identical model was worn at the showing of Dior's Autumn/winter 1954-1955 H line collection to Princess Margaret at Blenheim Palace on 3 November 1954. Mme. Arturo Lopez-Willshaw (Patricia), Chilean-born hostess, style leader; Paris. Pronounced 'International Best-Dressed Woman' by Vanity Fair in 1960. British Pathé film reel; ref ITN BP08115449312. 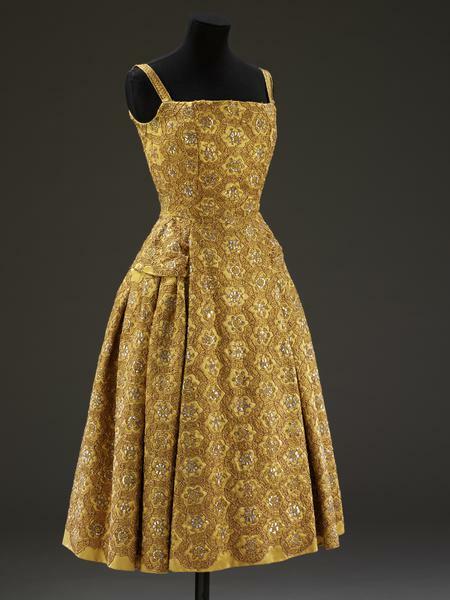 Dior showed this H line dress and coat at his Blenheim Palace fashion show in November 1954. Thirteen Dior models accompanied him to Britain for the show and his top model, the Russian Alla Ilchun, wore this ensemble. Embroiderers at Rébé took over 600 hours to create the dress’s elaborate gold metal decoration. Loyal Dior client Patricia López Willshaw ordered the dress and later donated it to the V&A.